A poor match came to life in the closing minutes as David Goodwillie cancelled out Juanma's goal to earn Ross County a point. The Spaniard's close-range strike seemed certain to give Hearts victory after a game that had offered precious little entertainment. But County pulled level when Goodwillie headed in Martin Woods' cross. The result means both teams have now won just once in their last seven games. There was no lack of effort from the players but inspiration was in short supply. The 'end-of-season affair' tag was never more apt as the players huffed and puffed. 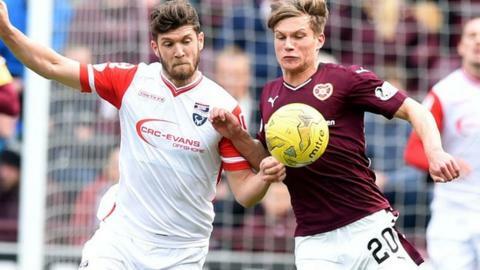 With Hearts already guaranteed third place and Ross County sitting sixth, there was little at stake and it showed. The 15,000 Hearts supporters in attendance at times voiced their dismay as their team went through the motions. That said, both teams will look back on successful, impressive seasons, making it difficult to be overly critical of a late dip in form. County, who have never won at Tynecastle, should have been ahead at half-time but Alex Schalk - sent through on goal by Woods - had his shot well saved by the out-rushing Jack Hamilton. Prince Buaben had a half-hit shot cleared off the line and twice in the second-half was denied by good saves from Scott Fox. But Buaben provided the cross from which Juanma appeared to seal the three points - the substitute stealing in to convert at the near post. His fellow substitute Goodwillie had the final say, though, as he too darted into the six-yard area to get on the end of Woods' cross to level the scores and earn County a deserved point. Match ends, Heart of Midlothian 1, Ross County 1. Second Half ends, Heart of Midlothian 1, Ross County 1. Corner, Heart of Midlothian. Conceded by Stewart Murdoch. Callum Paterson (Heart of Midlothian) wins a free kick on the right wing. Goal! Heart of Midlothian 1, Ross County 1. David Goodwillie (Ross County) header from very close range to the bottom left corner. Assisted by Martin Woods. Attempt missed. Raffaele De Vita (Ross County) right footed shot from outside the box misses to the left. Richard Foster (Ross County) wins a free kick in the attacking half. Goal! Heart of Midlothian 1, Ross County 0. Juanma (Heart of Midlothian) right footed shot from very close range to the bottom left corner. Assisted by Prince Buaben. Attempt missed. Callum Paterson (Heart of Midlothian) left footed shot from the right side of the box is just a bit too high. Corner, Heart of Midlothian. Conceded by Chris Robertson. Arnaud Djoum (Heart of Midlothian) wins a free kick on the left wing. Foul by Raffaele De Vita (Ross County). Juwon Oshaniwa (Heart of Midlothian) wins a free kick on the left wing. Andrew Davies (Ross County) wins a free kick in the defensive half. John Souttar (Heart of Midlothian) is shown the yellow card for a bad foul. Scott Fox (Ross County) wins a free kick in the defensive half. Substitution, Ross County. Raffaele De Vita replaces Jonathan Franks. Substitution, Heart of Midlothian. Dario Zanatta replaces Sam Nicholson. Corner, Heart of Midlothian. Conceded by Michael Gardyne. Substitution, Ross County. Liam Boyce replaces Alex Schalk because of an injury. Foul by Abiola Dauda (Heart of Midlothian).